In addition to the 24 comfortable guest rooms at our hotel near Greenfield, MA, we offer free wireless internet, locally hand roasted fair trade coffee all day long, and afternoon tea and cookies. In the morning enjoy our complimentary country breakfast, then visit Champney’s restaurant and tavern for a delicious lunch or dinner. If you want to stay in, you can borrow a film from our DVD library, play a board game, or grab a book from our shelves. You’re welcome to use our computer workstation to check email, print out boarding passes, or connect via Skype. If you would like to venture out, leave your car in the safety of our parking area while you take a stroll along the mile-long main street which remains much as it has for centuries. Deerfield Inn was named a 2017 TripAdvisor Travelers’ Choice Top 25 Small Hotel in the United States! During the first 15 years of its operation, guests arrived by stagecoach, carriages, and on horseback. (The carriage house and stables were built in 1883 prior to the inn being built. Names of the horses that were perhaps harnessed to bring guests to the inn in a trap, or perhaps work the fields, are still painted above the former stalls.) Later, a trolley line ran through the village – stopping right in front of the inn as an old photograph hanging in the inn shows, and by the turn of the century automobiles began to rumble in. The grasshoppers had long gone, but the guests stayed on and kept coming for—as a brochure from the 1920s promised – “the atmosphere and charm of early days, with modern comfort and convenience.” Breakfast started at 30¢, dinner could be had for $1.00, and a double room with running water was priced at $3.00. We are still a full-service Deerfield Massachusetts bed and breakfast in its original site on Old Main Street in a village listed as a National Historic Landmark, still surrounded by period houses, working farms, and beautiful open countryside. This little part of Franklin County is rightly known as The Happy Valley. 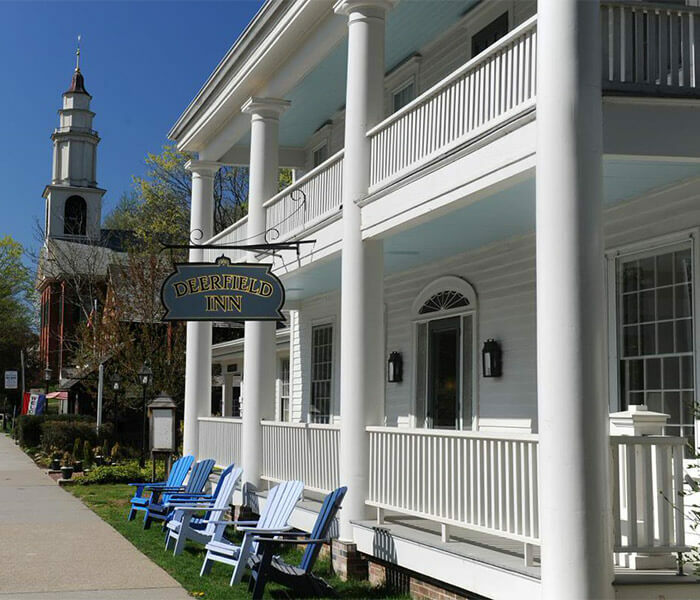 The Deerfield Inn now has 24 guestrooms between the main inn and its carriage house. The hay loft door is still there, and the horse weathercock still turns. The front porch ceilings are still robin’s egg blue, and indigenous plantings are still in the gardens. The floors in the main inn run up and downhill and around unexpected turns, and we understand from many, many guests that the same old nosy and sometimes cheeky ghosts still wander. Your room is ready at our bed and breakfast in Massachusetts, with or without ghosts, and we look forward to welcoming you here. 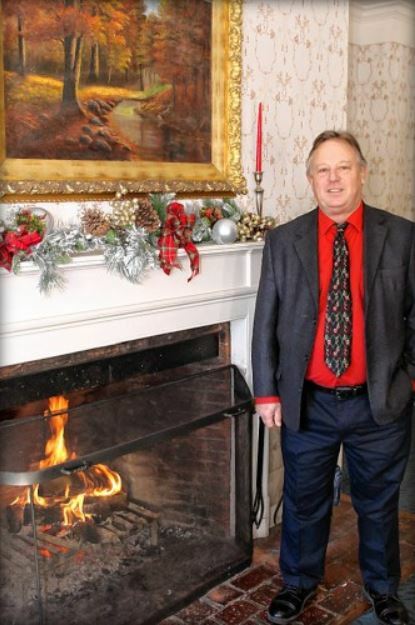 Historic Deerfield Appoints Steve Pardoe as Innkeeper of the Deerfield Inn. *December 16, 2016 (Deerfield, Mass. )— *Historic Deerfield President Philip Zea announced today the appointment of Steve Pardoe as the new Innkeeper of The Deerfield Inn. Pardoe, of Deerfield, has four decades of experience in hotel and restaurant management, and is a familiar face to Deerfield Inn guests, having worked at the inn twice before, first as the function manager from 1995-1998, and then as dining room manager from 2001-2005. A native of Manchester, England, Steve began his career at the Rashleigh Inn in Cornwall, England as a new graduate from South Trafford College of Hospitality and Restaurant Management. There he developed the inn’s intimate restaurant menu using his grandmother’s recipes as inspiration and locally-sourced, kitchen-garden ingredients; essentially “farm to table” before it was chic. Longing for respite from England’s notoriously dreary weather, Steve set his sights on the warm breezes of the British Virgin Islands, where he spent more than ten years in a variety of roles, from restaurant owner to hotel manager and even head chef on the “Wanderlust,” a 65-foot chartered yacht. While there, Steve met his wife of 34 years, Susan, and together they opened the Cooper Island Beach Club on a small island. Following the birth of their daughter, Rachel, Steve and Susan sought a more ideal location to raise a family, and resettled in western Massachusetts, where they opened the Bernardston Inn in 1983.
restaurant in Brattleboro, Vermont. The pub became a cornerstone of the Brattleboro community but unfortunately was devastated by Hurricane Irene in 2011. Steve and Susan still live in Deerfield, so close that he can walk to work. You may also meet his two now-grown daughters, Rachel and Jessica, when they visit the Inn – a beloved second home from their own formative years – and Steve’s new love, his beautiful granddaughter Eliana. In addition to the appointment of Pardoe as the new innkeeper, Alicia Graves, of Orange, Mass., formerly the inn’s Special Events and Private Dining Manager, has been promoted to Assistant Innkeeper/Banquet Sales. To easily find our hotel near Greenfield, MA, put “81 Old Main Street” into your GPS, and select Deerfield. Take Route 2W to Greenfield. Go left over the bridge through Turners Falls, and take a left onto Routes 5 & 10 under the trestle railway bridge. There are signs to Historic Deerfield, the Deerfield Inn, and Champney’s. 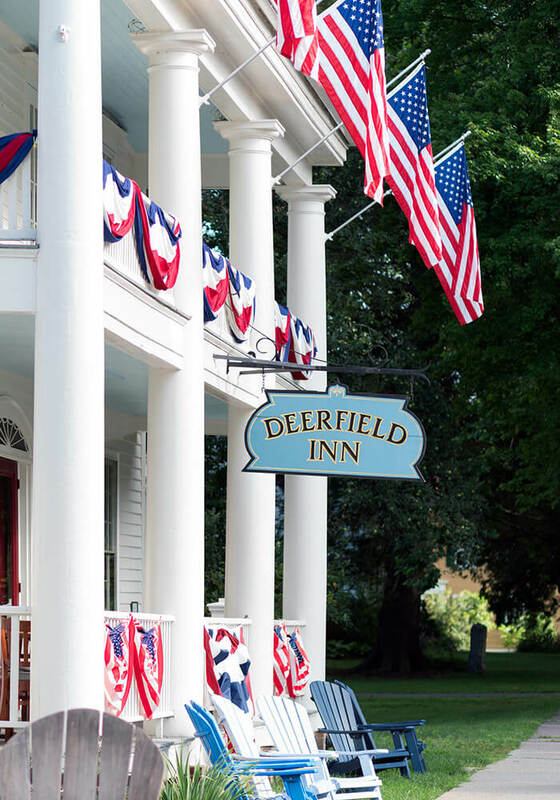 Take the first right into Deerfield, and follow Old Main Street left to the Deerfield Inn, a half a mile down on the right – a large white-columned clapboard building with a porch in front. Take I-90 W and take exit 4 in West Springfield to I-91N. Take exit 24 off I-91, bear right off the ramp, and continue on Routes 5 & 10 N. Drive five miles. On the right are signs for Historic Deerfield, the Deerfield Inn, and Champney’s. Coming up on the right will be Richardson’s Candy Kitchen. Take your first left immediately after this by the directional sign, and then bear right where the street forks. The Inn is half a mile down on the left, a large white-columned clapboard building with a porch in front. Take I-91 N. In Mass take exit 24. At the end of the ramp bear right and you will be on Routes 5 & 10. Drive five miles. On the right are signs for Historic Deerfield, the Deerfield Inn, and Champney’s. Coming up on the right will be Richardson’s Candy Kitchen. Take your first left after this, by the directional sign, and bear right where the street forks. The inn is half a mile down on the left, a large white-columned clapboard building with a porch in front. Take I-91 S In Mass take exit 25. At the end of the ramp bear left and left again at the lights, and you will be on Routes 5 & 10. Drive five miles north. On the right are signs for Historic Deerfield, the Deerfield Inn, and Champney’s. Coming up on the right will be Richardson’s Candy Kitchen. Take your first left after this, by the directional sign, and bear right where the street forks. The inn is half a mile on the left, a large white-columned clapboard building with a porch in front. Take Route 9 to 116 N. At Routes 5 & 10 go right (North) for five miles. On the right are signs for Historic Deerfield, the Deerfield Inn, and Champney’s. Coming up on the right will be Richardson’s Candy Kitchen. Take your first left immediately after this by the directional sign, and bear right where the street forks. 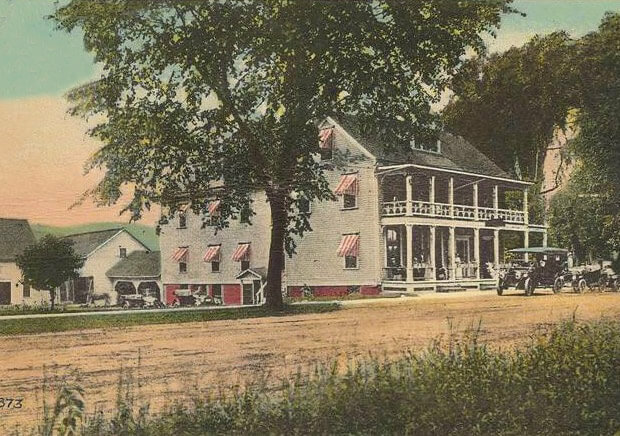 The Inn is half a mile down on the left, a large white-columned clapboard building with a porch in front.